Grow Grammar - Create - The Beautiful Apple from eeiioo on Vimeo. Now the app is priced at £4.99 and while it is a great way to revise SPaG, with school budgets tightening it may not be affordable for some. Having this open on your laptop and checking the odd sentence as a quick reminder for children and can be a really useful revision tool. 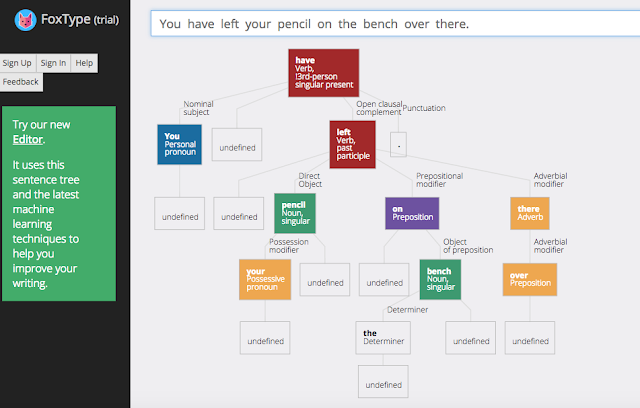 Visit the Sentence Tree Website Here. I have been wanted to find a way to create my own VR for a while and CoSpaces seems to be a great tool for this. The website and app both allow you to create your own VR environment. It is free to use and just needs an email and password to get going. This week my digital leaders gave it a whirl and they absolutely loved it. To begin with they were given some tinkering time. I gave them 15 minutes to simply play, experiment and discover the app and the way it works. So a couple of weeks ago, I went to see the sequel to a very iconic British film. I enjoyed it immensely. My favourite scene has to be the iconic 'Choose Life' monologue. It got me thinking about a more age appropriate version for young people to relate to. So with my Year 6 digital leaders, we considered all the different aspects of how to live a happy and successful life. Here it the fourth instalment of the adventures with Mrs May. This time looking at the book "Don't be silly." Enjoy! This afternoon, I had the pleasure of working with our Year 5 as they embark on their Ancient Roman topic. We decided as a class to create our own interactive timeline. Firstly, we discussed which important events we would include and tried to link some of these to the impact Romans had on Britain. 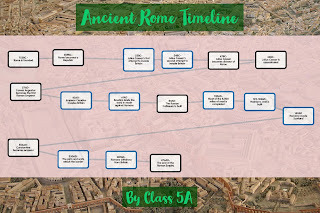 Once we had decided on the events, we put them into a timeline using the app Popplet. Each video was linked to the timeline using the app Thinglink and saved to our Thinglink account. The class could then load the thinglink of their devices and watch every other group and learn about that event from each other. Learning about the body with the amazing Curiscope Virtuali-tee app! I love using technology to create moments of awe and wonder with my pupils. Two of the best tools for this are Augmented Reality and Virtual Reality. Imagine an app which combines both to make learning about the Human Body more fun and interactive than ever before! I have been following the progress of the Curiscope project for the best part of a year after backing the campaign on Kickstarter. It is fantastic to finally see the app and t-shirt available. The app is FREE however it needs one of the t-shirts to work. The t-shirts come in a variety of colours and sizes and can be ordered here. Once you have the t-shirt, one pupil can wear it and the others can use the app on different devices to scan the t-shirt, where they are then able to see inside the body! As you can see with the following gif created with my sons. It's the Weather - Another adventure with Mrs May! I felt compelled to make the following video with some thoughts and ideas about how we should be teaching Internet Safety. The Fantastic Toontastic to Create Animated Films! In this rich digital world we live in, we are exposed to visuals more than every before. We engage with visuals more than text and children especially seem to engage watching endless Youtube videos, films, TV shows etc. One thing we should be teaching children is that the only way to get decent visual media is to write decent content first. When children are given the opportunity to transform their writing from lifeless text on the page to a digital story, it motivates them, gives them a purpose and the opportunity to develop a range of other important skills. This approach underpins a lot of my ideas on the blog and also the READWRITEPERFORM approach. A new app I have discovered which is a fantastic way for children to make their own animated films is Toontastic 3D. The app is so easy and simple to use. Entreprenaws - Bringing business and enterprise into the classroom! I am a massive fan of using technology and apps that provide a real world context for children to apply their knowledge and understanding. A new app, which fits this category perfectly is Entreprenaws. The app has been created by the Stepping into Business team, who are on a mission to try and teach and educate younger students about entrepreneurship and business. The app does this by developing a range of skills in a fun and engaging game. I have known about this app for a while as some of our pupils were lucky enough to test some early versions of the game. The reaction to it from our pupils was extremely positive: the discussions, explanations and problem solving the children were demonstrating from using the app was really impressive.